Since 2003... F. Lennox Campello's art news, information, gallery openings, commentary, criticism, happenings, opportunities, and everything associated with the global visual arts scene with a special focus on the Greater Washington, DC area. Laura Beth Konopinski arrives in August! 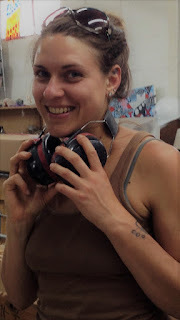 The Washington Glass School (WGS) has announced the hire of Laura Beth Konopinski as Studio Coordinator. Laura Beth will coordinate the projects and classes of both the Washington Glass School and the public art projects of the Washington Glass Studio, as well as acting as the liaison for the Studio Artists and Residency Artists that are part of the WGS Arts Incubator. She will also be working with us at various art fairs around the nation. 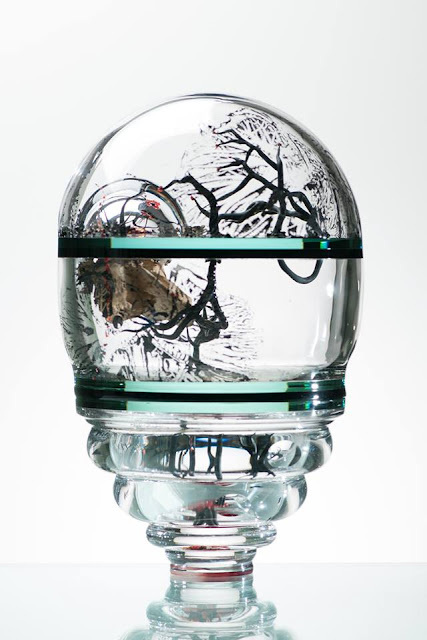 Laura Beth received a BFA with glass emphasis from Bowling Green State University in Ohio. She has taught and worked in facilities such as the Pittsburgh Glass Center, Penland School of Crafts and the Corning Museum of Glass, which has allowed her to explore many methods of the glass making processes. For 3 years, Laura Beth worked as assistant to noted glass artist, Susan Taylor Glasgow. Laura Beth Konopinski, “Within the chambers of Your Blackened Heart” Blown and recycled glass, sculpted, enamel, preserved organic materials, mixed media. Throughout her artistic career, Laura Beth Konopinski has kept her material concentration primarily with glass, although uses other mediums including photography and metal. Arising from her interests with environmental conservation, Laura Beth repurposes used materials and integrates carefully preserved organic compounds into sculpted layers of glass. She uses transparent glass as a lens for distortion with great effect to emphasize the ambiguous nature of human emotion. Laura Beth facilitates the idea of comparing reason and sentiment by combining figurative imagery with biological materials. “We’re thrilled to welcome Laura Beth to our team,” said WGS Co-Director Tim Tate. “She is a bright young talent who will play a critical role managing WGS’ projects and ensuring the quality as we implement our business and artistic ideas”. Read a great profile about Laura Beth by Missouri’s Columbia Daily Tribune – click HERE.